We have been having such dreary, wet weather here in Northern California recently, and it has made me yearn for sitting outside in the sun, fussing over my potted succulent garden. So, of course, I have been sitting inside, on the internet, looking at ways to decorate pots. Behold, tutorials! Gotta love a little bit of glitz (without being overwhelming!!) 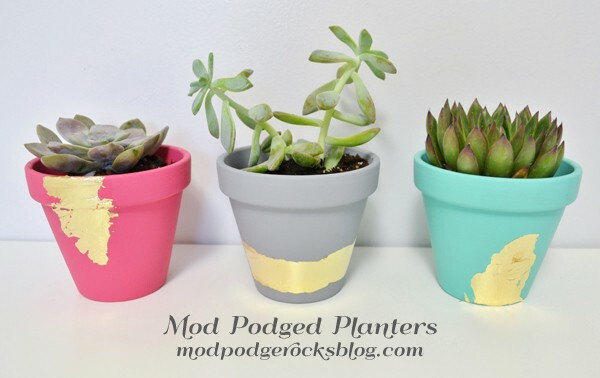 on these awesome gold leaf planters over at Mod Podge Rocks. I really love the gray one, but the aqua one would match my other pots so well! Now, I'm not exactly a girly-girl, but I love these decoupaged lace containers over at Urban Comforts. What a great way to use vintage textiles in an unconventional way. Everyone is still on the chevron bandwagon, right? 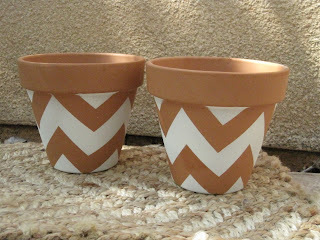 Gibb Gabb showed us how to chevron your pots back in 2011, back before everyone was chevron-crazed. Design Sponge shows us how to put chalkboard "labels" on terra cotta pots, which I think would be perfect for herbs in your kitchen for some indoor gardening! You can even find downloadable templates for the different labels, and I can also think of about a thousand and one other uses for those templates.